Have you considered getting your children or someone else a pet for Christmas? 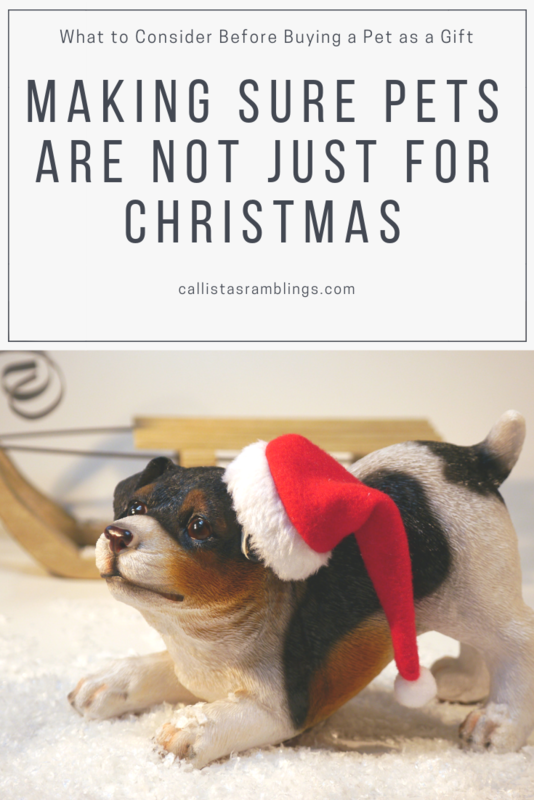 If so, you should read this guest post from Jocasta Epson on making sure pets are not just for Christmas. Christmas is just around the corner and you’re probably already in the process of buying or making the perfect presents for your little ones. One gift that makes a huge impact is a pet. A simple YouTube search would show you some tear-inducing videos of people getting pets and their very emotional reactions. Studies have shown that having a pet can do wonders for a person’s health. If and when you do decide to get someone a pet, remember to approach your local shelter first. While it may be a long process, you can be sure that you will be given a pet that will suit the recipient. This would also lead to giving two lives the gift of love this Christmas season, it’s a win-win. Let’s start this off with the obvious: don’t give pets as surprise gifts unless the recipient has made it clear that they want a pet and that they can take care and raise the pet responsibly. Finances play a big role here since a new pet will come with its own set of expenses. According to the Ontario SPCA, a new puppy can set you back by almost 3000 dollars and a kitten will cost 2000 dollars during their first year alone. While these two species may be the go-to choices when it comes to pets, you may opt for other animals like fishes, birds, reptiles, and even bugs! A stereotypical gift for young kids would be a hamster but the Humane Society actually does not recommend this since this could possibly be dangerous for both the kid and the rodent. One thing to note for recipients who already have pets is whether their incoming pet would get along with their current one. Getting a snake owner a pet gerbil might not be the best decision in the same way that cats and fish aren’t exactly the best of friends; you don’t want one pet ending up as another one’s snack. This also applies to pets of the same species but different breeds, genders, and ages. Huskies, for example, can be very rough and may end up injuring your new puppy; two male dogs might not get along and pee on everything in a race to see who can own more of the house. Before giving your friend their new pet, give them a pet kit. This could include any grooming materials, beds, maybe a folding cage, and some pet chew toys. Now would also be a good time to help your recipient learn about raising a pet. Be sure to prepare the recipient’s house and family for the new pet. A good start would be pet-proofing their house like putting toxic substances away where the pets can’t reach them. Another matter to settle would be the role of each member of the household when it comes to caring for their new companion. Not everyone can tend to an animal 24/7 so it’s best to assign certain tasks to certain individuals depending on their schedules. Regardless of whatever pet you choose to give, make sure that they’re going to a good home that will truly love them. Pets are lifelong commitments but when shown love, can return it tenfold. These creatures will depend on their new humans so it’s up to you and your recipient to make sure that their new companion is well taken care of.